Without question, over feeding and lack of suitable levels of physical exertion are the leading cause of obesity in dogs (as well as people). For many dog owners, feeding the right portion size for their dogs is something left to a fairly non scientific approach of measuring out enough food to fill the bowl. In fact, there are many owners (because I used to be one of them) who find it hard to put a bowl of dog food down if it's not positively full to the brim, this despite the fact that different types of dog food have completely different nutritional components. If we think about portion control like this: what's the difference between a bowl full of fish and pasta and a bowl full of chocolate and lard? We can establish that portion size and nutritional elements of the actual food are not one and the same thing. In other words, a bowl full of food is not something to trust to our instinct and feel, we should definitely read those pet food labels! Cesar Millan, the Dog Whisperer, polarises views across the dog community like nobody else. But, interestingly, there is one area where his oft quoted views are universally agreed upon. Over feeding dogs is bad, bad, bad! "If dogs ran the world, the Canine Café would be open 24 hours a day. Most dogs love to eat. And eat. And eat some more. But though it’s tempting to show your love with extra helpings, or by making food available all day, overfeeding does no dog any favours. (Overweight pets can suffer from the same ailments as hefty -humans do.) There is no precise answer as far as how much to feed a dog, -because caloric needs vary with size (a Chihuahua doesn’t chow down like a -Mastiff), age, and activity level. One rule of thumb is that if Sir Barksalot is -energetic and keeping his figure trim, he’s probably eating the right amount. Food packaging offers recommendations, but remember: Those are just guidelines (see “Use a Measuring Cup”). How often should you feed your pal? Morning and evening meals are recommended for adult dogs. (Puppies are a different story; go by your vet’s advice.) Twice-daily feedings make it easy to monitor your dog’s intake, and thus his health, since dogs who are not feeling well tend to drop their routines. Also, regular feedings keep a dog…regular." Victoria Stilwell, the British dog trainer of TV and book fame, says that overfeeding a dog is just as neglectful as not feeding one. We'd argue that it's actually worse. According to latest figures from the PDSA, a shocking 2.9 million dogs in the UK are obese. Obesity can lead to serious health problems and a lower life expectancy, so it is more important than ever that we understand how to keep our hounds happy and healthy. When considering our own health we are all aware of the importance of exercise and a sensible diet, but don’t necessarily apply the same rules to our pets. However, there are lots of factors that contribute to increased weight gain, including breed, age, overfeeding, inadequate exercise and neutering. Certain breeds are more prone to weight gain due to varying metabolisms and body composition, and therefore we need to take even greater care with their diets. These include Labradors, Cavalier King Charles Spaniels, Cocker Spaniels, Scottish Terriers and Beagles to name a few. However, any breed may have a tendency to gain weight if they do not get the right balance of diet and exercise. Age is a very significant factor. Middle-aged dogs are more prone to weight gain. Whereas, older dogs have a reduced metabolic rate and a decreased muscle mass. They need less energy, so should have a reduced calorie intake. 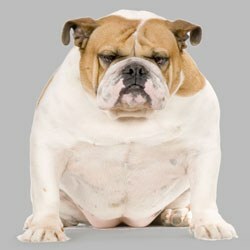 Overfeeding provides more calories than your dog uses in everyday activities, which are then stored in the form of fat. But despite the consequences of a poor diet, 90 per cent of dog owners admit to feeding their pets treats such as cheese, crisps, cakes, biscuits, toast and takeaways. Too many treats, leftovers and ad-lib feeding are particularly common factors in weight gain. The amount and frequency of food is not the only factor though. If you feed your dog a cheaper food, it is more likely to contain high levels of fat, calories and undesirable additives. So if your dog is overweight you should speak to your veterinary advisor about adjusting the diet to reduce their calorie intake and regularly monitor their weight. Finding the balance between your dog’s unique nutritional requirements and a suitable level of exercise is the key to keeping them healthy. Walking your dog at least twice a day will help maintain their fitness and keep them occupied. After all it’s not just physical but also mental stimulation that they need! Exercise burns calories which would otherwise be stored as fat, so it is important to bear in mind the amount of exercise your dog gets when calculating the right amount to feed – increase the calorie intake if your dog does two hours or more exercise per day and decrease the calorie intake if it’s less than 30 minutes. Neutering can lead to a tendency towards weight gain. When a dog is neutered, their metabolic rate lowers, which means that they require less food than prior to the operation. Hormones such as oestrogen can have an inhibitory effect on food intake. Neutered females have reduced levels of these hormones and neutering males can decrease the amount of spontaneous activity, which burns calories. When we become dog owners, we must take on the responsibility of making sure our dogs live a healthy lifestyle. We must be willing and motivated to make changes if necessary to help our dogs loose those extra pounds. So when it comes to your dog's food, it's absolutely essential that you feed the right amount relevant to your dog's age, breed, current weight and lifestyle. Speak with your vet if you need to. Understand pet food labels and above all, don't make that classic mistake of simply filling the dog's food bowl to the brim. I have been running a small rehoming shelter for over 8 years and have had to feed thousands of dogs. I go by the rule the dog eats when the food goes down or goes hungry till next meal time and you should be able to feel the ribs but not see them. If you can see them increase the food a little and if you cant feel them reduce the food a little and feed the best quality dry dog food you can afford. As a more or less perfectly sized Westie, I know that my sleek features are nothing to do with me. As a dog, I have never worked out the idea that my next meal is guaranteed, so I can pull “hunger” any time a snack is on offer just in case it is the last one I ever see! But I have been out smarted, it appears. Thanks to a rather nasty, underhanded device called “kitchen scales” I never get overfed or underfed – despite hours of grumbling, whining, sucking in my tummy to look thin and the rest of it. It is totally against my rights – I am sure of it! On the other hand, I can run like the wind (that is wind with short legs, you understand), do dog agility, walk 3 or 4 miles without a problem and will continue to do so for many years yet. Still cant catch those wretched squirrels though!